Over the last few decades, politics in India has moved steadily in a pro-business direction. This shift has important implications for both government and citizens. In Business and Politics in India, leading scholars of Indian politics have gathered to offer an analytical synthesis of this vast topic. Collectively, they cover the many strategies that businesses have used to exert their newfound power in recent times and organize the book around a few central concerns. 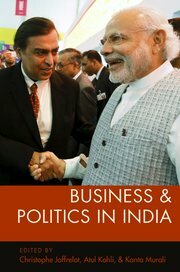 They first analyze the nature of business power and how it shapes political change in India. Second, they look at the consequences of business’ growing power on some important issue areas-labor, land, urban governance, and the media. Finally, they take account of regional variation and analyze state-business relations. This definitive account offers significant insights into how and why corporations have increased their power in contemporary Indian politics.